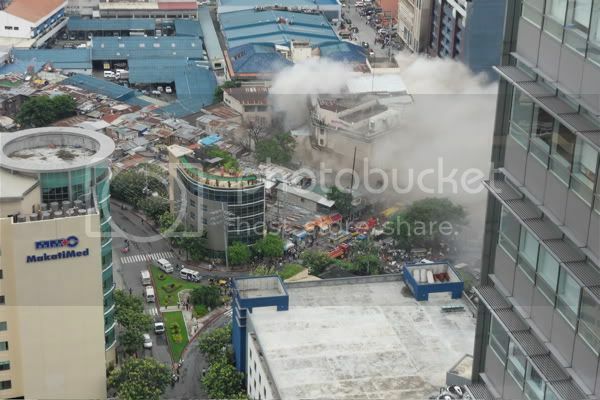 a fire razed the campos rueda building along pio del pilar street in makati yesterday, and being on the 30th floor of RCBC, we had a very good view of the smoke billowing out of the old building. this isn't the first time that we've witnessed something like that. since we have a 350-degree view (the other 10 degrees is obstructed by the yuchengco tower) of metro manila, we've seen many fires from as far away as quezon city and the port area in manila. 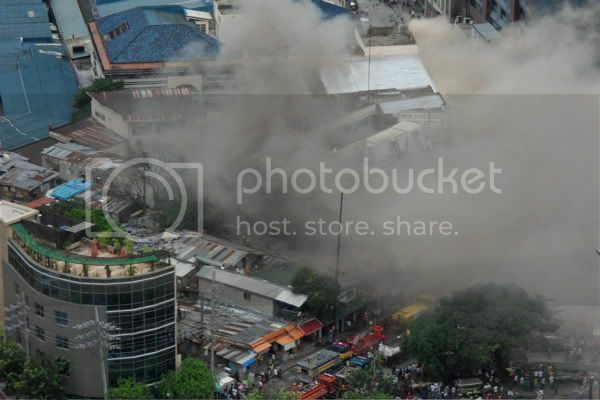 but this fire in makati, which is about 60 meters only from the makati fire station, was so far the closest. sirens of fire engines filled the air from past 3pm all the way till late at night when i got back from french class. anyway, i already posted a breaking news photo on facebook (beat the news services), but i suppose it also serves a purpose to post them here. also, check out my youtube video.